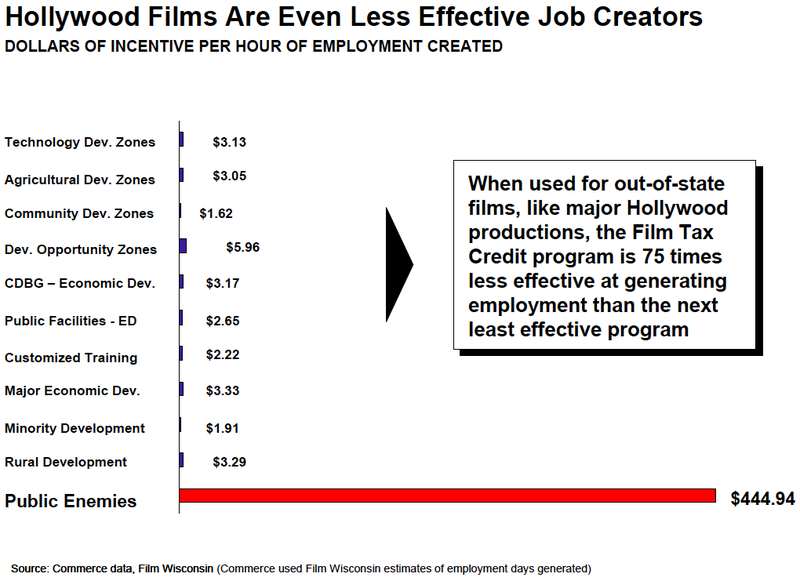 The Wisconsin tax credit program for films went into effect in 2008. The Johnny Depp film Public Enemies was one of the first beneficiaries. 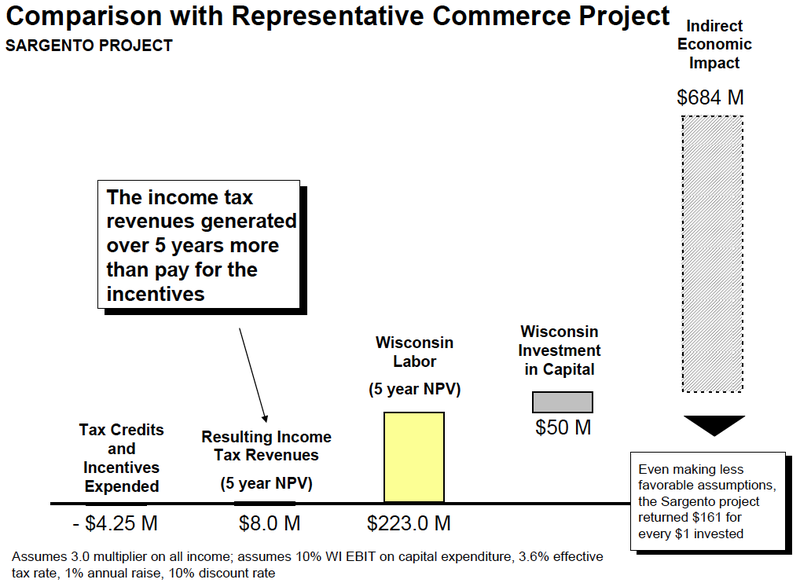 The film’s producers claimed $18 million in expenditures under the program for the portion of the budget with some connection to Wisconsin (the total budget was around $100 million). 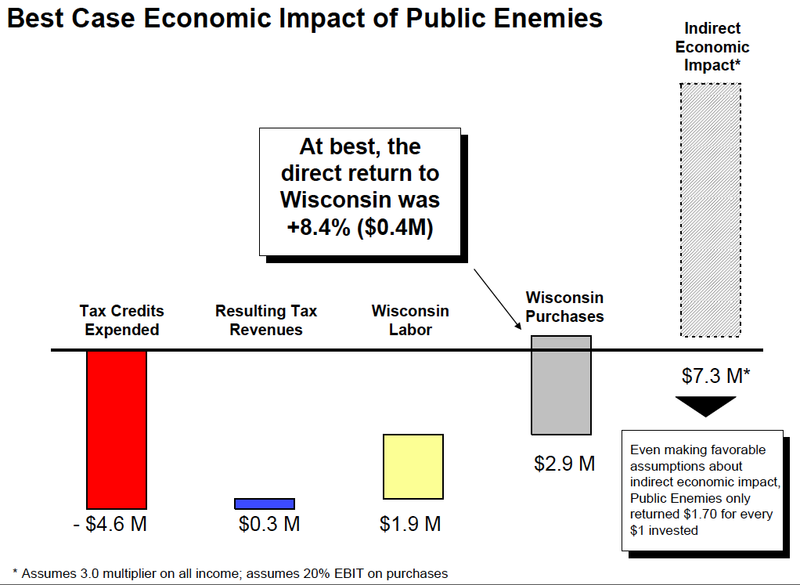 Here’s the best case scenario for economic impact: +7.3 million to the Wisconsin economy, almost all in ‘indirect’ impact. The direct activity was completely subsidized. 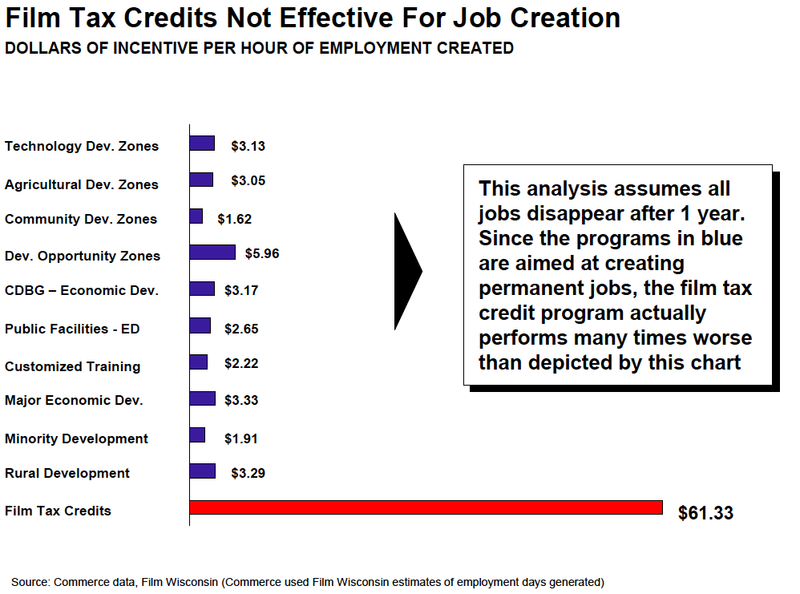 This turns out to be a very inefficient way to create jobs in Wisconsin! And investing in ‘Hollywood’ productions is even worse! 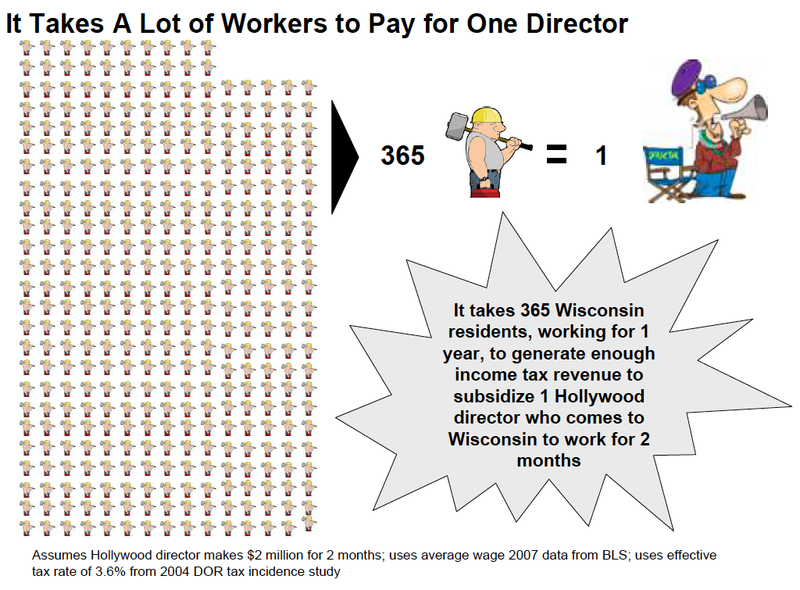 But at least Wisconsin’s tax payers get a brief visit from a Hollywood director. And who says America doesn’t make things any more? 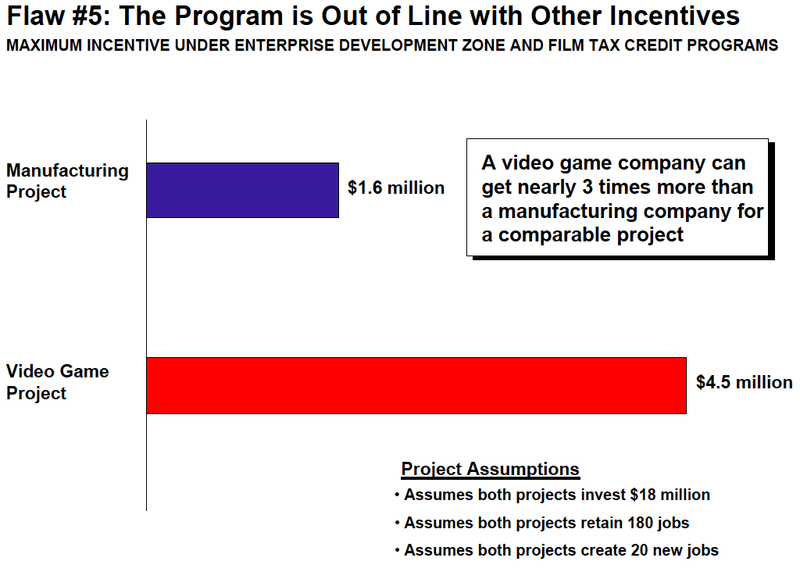 It’s a great country for movies and… videogames? (More on this some other time). The relatively good news is that the subsidy was capped in 2010 by Democratic governor Jim Doyle to a mere $500,000 per movie. 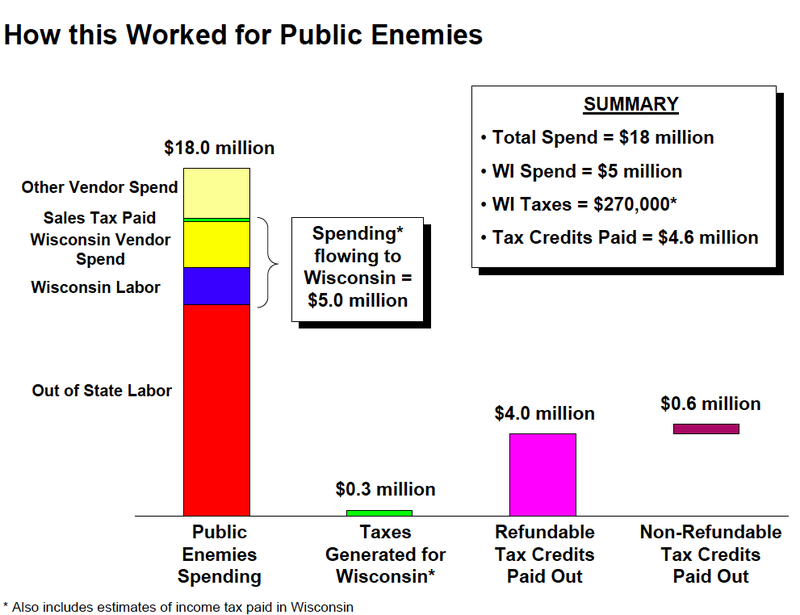 But how does the new austerity-loving Governor Scott Walker feel about this use of public money? 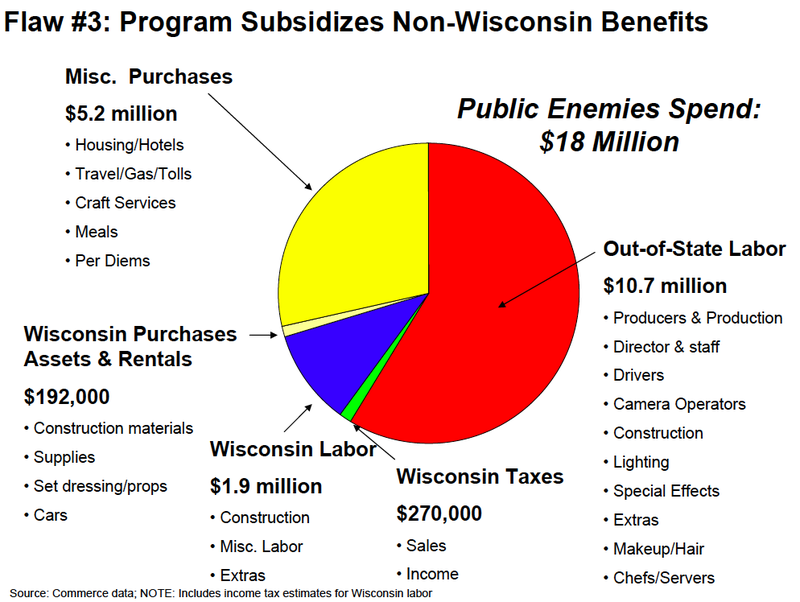 There has been no further action: a recent vote to reduce the subsidy further deadlocked in the Wisconsin Assembly, with four Democrats and four Republicans voting to retain it and eight Republicans voting against. 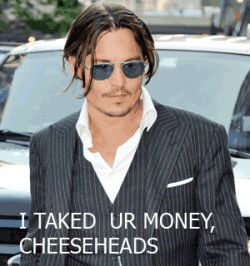 Records obtained by the Associated Press show the state’s film tax credits also paid for a portion of Mann’s assistants’ salaries, entertainment, meals and stuntmen’s living expenses.Wisconsin Commerce Department executive assistant Zach Brandon said the state’s tax credits even covered about $100,000 of the cost of Depp’s entourage of chauffeurs, hair stylists and assistants.He said the 1-year-old film tax credit program needs major overhauls. But VISIT Milwaukee public relations director David Fantle said it’s too soon to be talking about making wholesale changes. Public Enemies made $214 million worldwide.